While we were looking the other way, Queen Máxima got herself into a spot of trouble. 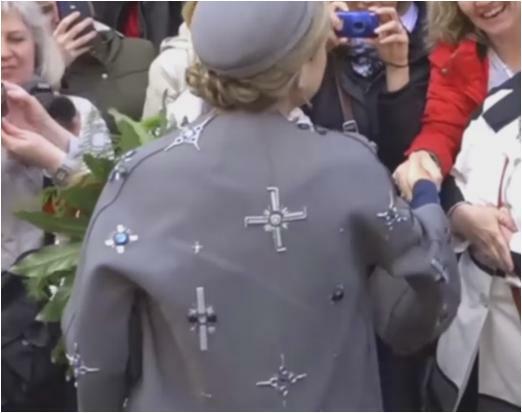 She and King Willem-Alexander headed out to Bavaria last week - the Dutch royal couple make an annual working trip to Germany - and on day two, she repeated a coat first worn during the Dutch state visit to Denmark last year. The controversy has been blown out of proportion, but it also would have been terribly easy to avoid. Considering we just spent a week discussing the intent behind a tour wardrobe, this is a prime example of why so much thought goes into such things. Coat controversy aside, the rest of the visit had everything you expect from your standard Máxima tour checklist. Big hat: check. Sparkle: check. I almost thought the evening dress (right, above) had a built-in sparkly collar until I came to my senses and realized that there was a diamond rivière there, because of course. This dress is different from the one she wore for the state visit to France this year, yet it is almost exactly the same. Sparkleblergh must have really been speaking to her this season. For more: See here for a gallery from Day 1, or here for Day 2.